The next meeting of the NJ World War II Book Club will be on Tuesday, April 16, at 7 PM, as usual at the Millburn Library. Our speaker will be David G. Stroebel a local author who has just published his first book, The Cannon King's Daughter. Mr. Strobel, curious about his family history, began interviewing older family members and relatives about his Germanic roots. What started out as a personal quest for information about the family took a startlingly sharp turn when he stumbled on the very disturbing fact that his ancestors were the infamous Krupp family, the steel dynasty that supplied the German army in World War I and the Nazis in World War II with the U-Boat, machine guns, and massive cannon. This is a story told in exquisite detail by historian William Manchester in his prize winning The Arms of Krupp which provides the historical backdrop to Stroebel's family history. At the end of World War I the Allies sought unsuccessfully to punish the head of the Krupp dynasty. At the Nuremburg trials following World War II, Alfred Krupp was sentenced to 12 years imprisonment for utilizing slave labor. Mr. Stroebel, skillful using Ancestory.com and other research tools, brings to light many details of the family history never previously disclosed. In the process of researching his own history, Stroebel also gives his reader what amounts to a mini-tutorial in genealogical research, of particular use to those of us also interested in looking into family history. Members are reminded to check our web site and view the many photos that our talented photographer Sharon Austin has posted on the site. These photos are available for sale. Contact Sharon Austin at: sharonannaustin@hotmail.com, for more information. 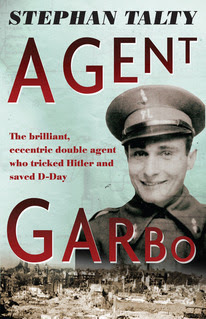 The March 19 meeting of the NJ World War II Book Club was the occasion for a new format in the Club's monthly meetings, that of a hosted book discussion, with Dr. McLaughlin asking questions of the Agent Garbo author, Stephan Talty. In a departure from the usual lecture format, the evening proceeded with questions by Dr. McLaughlin ranging from requesting the author to tell the audience a bit about himself to asking about Joan Pujol's wife, his role in the Normandy invasion deception, as well as his life after the war (one could say two lives...). If you missed this exciting evening, no worries, as the event was taped by Richard Schonberg and can be seen by clicking here. Shanghai 1937: Stalingrad on the Yangtze. One of the most crucial and dramatic battles of the 20th century took place in Shanghai, in the autumn months of 1937. China’s largest city was engulfed in a deadly clash between Japanese invaders and forces commanded by the supreme Chinese leader of the time, Chiang Kai-shek. The battle, which involved hundreds of thousands of soldiers on both sides, marked the opening chapter in what was to become a protracted Sino-Japanese War. Therefore, it was also indirectly one of the main causes of America’s eventual entry into World War II. Peter is in the privileged position of being able to read Mandarin and also has access to important archival sources in Taiwan, the successor state of Nationalist China, which did much of the fighting against Japan. If there are certain aspects of the Sino-Japanese War that members of the New Jersey World War II Book Club would like to see covered on his blog, he would be very interested to hear from them. They can contact him either via his website www.shanghai1937.com or directly by email chinawwii@gmail.com. While he cannot guarantee that any request will result in a blog post, each email will receive a personal reply.